Cooler Master's newest product, JET 7, has finally arrived. The new and improved Jet blower derives from the successful Aero blower. 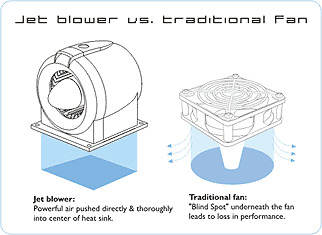 The amazing Jet 7 comes with an incredible blower that provides high airflow with the same air pressure and rpm rating. On top of the improved blower, Cooler Master also matches the Jet blower with new high performance stacking fin heat sink. This allows more heat dissipation area. 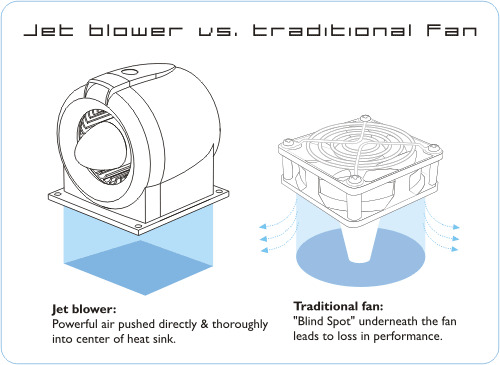 Thanks to Cooler Master's creative R&D team, the blower housing resembles a jet engine, especially with the bright LED lights placed on the front and the rear of the blower. You will not regret your purchase when you join the force with us and feel the vigor!